Cutaneous NLE is best managed conservatively. Low-potency topical corticosteroid therapy may aid in decreasing inflammation, and sun protection measures are advisable. 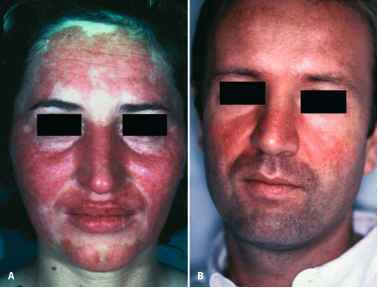 Residual telangiectasia may be treated with a vascular laser such as a pulsed dye laser. Optimal therapy for cardiac NLE has not been established. Pacemaker implantation and medications traditionally used to treat heart failure are used when indicated. Several other therapeutic interventions have been tried, including prophylactic therapy of the mother with corticosteroids during the first trimester, corticosteroid therapy during gestation for fetuses with heart block, plasma exchange for an infant with heart block and cardiomyopathy, and corticosteroid therapy for neonates and infants with progressive disease (Copel et al. 1995, Shinohara et al. 1999, Taylor-Albert et al. 1997,Yamada et al. 1999). Larger studies are needed before particular approaches may be accepted as standard care.